Without a doubt when speaking of ice climbing in the Midwest, the first area that comes to mind is Michigan. 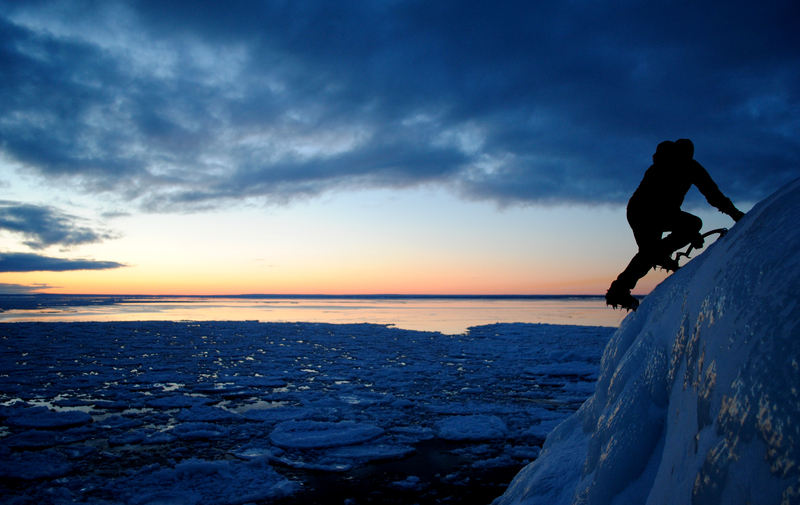 Nestled on the shores of Lake Superior, the Upper Peninsula offers some of the countries most outstanding ice climbing. This part of Michigan is a sparsely populated region with predominately northern hardwood forests. Hidden within these forests sandstone bluffs seep water that forms spectacular blue ice formations. Along with these seeps hundreds of waterfalls are also available for climbers to explore. Stop by one of our shops for the most up to date ice conditions or to check out the latest and greatest climbing equipment available to the aspiring ice monkey. Also, don’t forget that we offer ice climbing equipment rentals out of our Munising location, and every February we organize the Michigan Ice Fest. The Michigan Ice Fest is the perfect place to become familiar with the area and to meet other climbers from the Midwest. It happens in Munising on the first weekend in February every year. For more info please visit www.michiganicefest.com. Climbers looking for ice in the Houghton area have more options that one might think. This area of the Upper Peninsula has a fair amount of high quality routes with relatively short approaches that seldom get climbed. If you’re in the area stop by the shop for some beta, and if you give us a heads up it’s usually not too difficult to get one of us to show you around. Just west of Houghton along the shore of Lake Superior between the towns of Red Ridge and Freda on the west side of the Keweenaw Peninsula you will find a section of lake cliffs that rise anywhere from 40-80 feet out of the water. This is the largest concentration of climbable ice in the Western U.P. and it is not to be missed. Access usually requires the presence of shore ice along the lake as most of the cliffs drop straight into the water of Lake Superior. So, stop by the shop before you go to make sure everything is ready to go. Cliff Drive is located about 20 minutes north of Houghton. Here you will find a handful of climbs tucked into the dense woods of the Keweenaw. Finding the ice is sometimes the most difficult part of climbing in this area, so a trip to our shop in Houghton is a must if you aren’t from the area. We’re happy to share any beta we have… you just need to ask. A short hike up the snowmobile trail on Sixth Street in Tamarack City gets you to the beautiful Hungarian Falls. Hungarian Creek tumbles overs a series of falls on its way down to Torch Lake. The upper falls are around 20 feet high, while the lower falls provide a 50 foot drop, which is spectacular. The lower falls are the main attraction and can easily be protected from above which makes this area a great place for beginning climbers. And don’t miss the side falls to the west of the lower Hungarian falls. The central U.P. provides a wilderness atmosphere with climbs tucked back into the forest. The more popular climbs include AAA Wall in Big Bay, the Lakeshore Climb and the Grotto in Marquette, and Happy Rock just north of Michigamme. 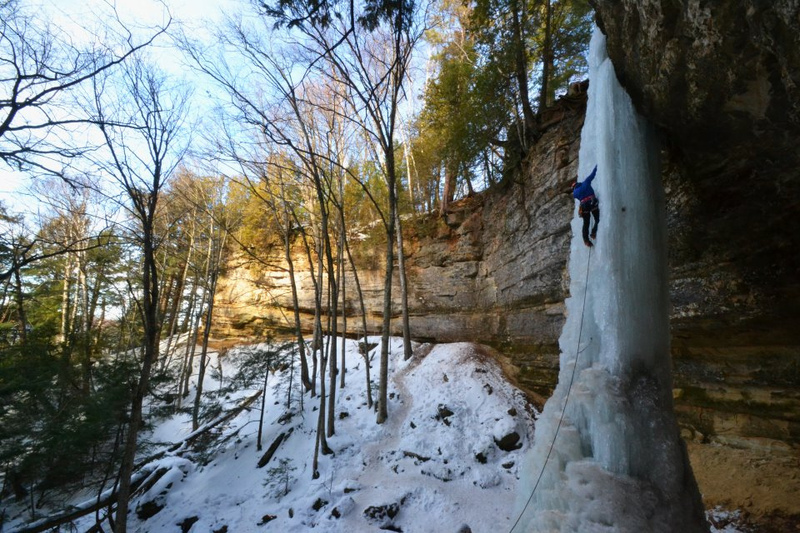 But if one is traveling from afar to climb ice… Munising is the motherload of ice climbing. Pictured Rocks National Lakeshore and Grand Island consist of sandstone cliffs that rise magnificently up to 190 feet above the shores of Lake Superior. 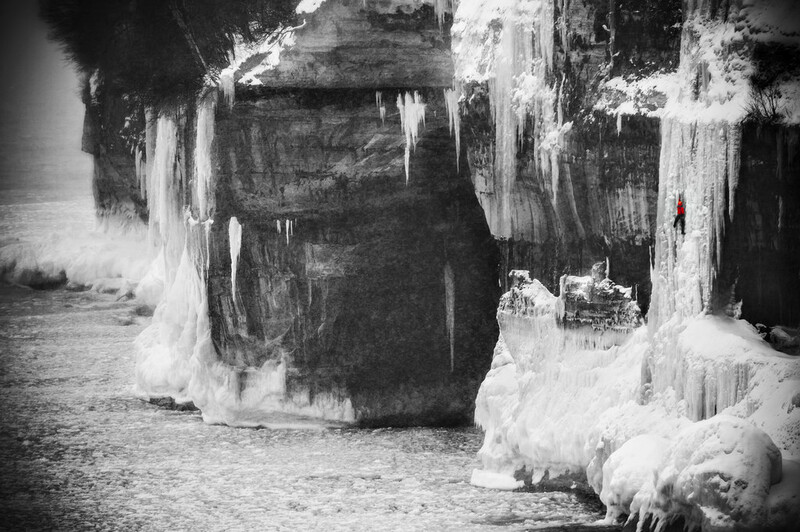 During the winter months between December and April these sandstone cliffs seep water that forms thousands of spectacular ice curtains and pillars. These are some of the classic climbs in the area that you just have to do. Don’t head home without baggin’ these great climbs. This is the classic formation along Sand Point Road and a must for all visiting climbers. This type of large freestanding pillar is typical for the Munising area. The Dryer Hose, like most climbs in Munising, forms in an large overhanging sandstone bowl. The pillar forms a large cone at the base and narrows a great deal towards the top. Super fun and should be your first stop in Munising! A mega-classic on the lakeshore- it is the largest formation in the park. The climb usually forms two large pillars that come together at the top to produce massive formidable bat wings. Ice is typically very brittle, three-dimensional, and the route is very sustained. The climb has the character of a sea-cliff climb, due to the ominous presence of Lake Superior at its base. Located on the Lakeshore Trail, about one hour snowshoe from the Sand Point parking lot this pillar is almost a carbon copy of the Dryer Hose with a large bat wing that develops each year on climbers left. It is best to rap in from the top of the climb and lead out. Need help locating the climbs? 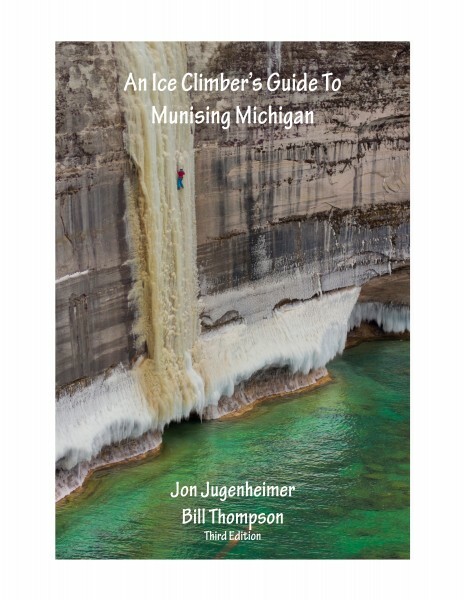 An Ice Climbers Guide to Munising Michigan is a valuable tool to locate all of the classics above and even more! The guidebook is available in all of our store locations.